Decorating a room from scratch can seem like a daunting task, but like anything else that seems difficult an organized; a step-by-step approach will make it easier. If you want to know how to decorate a room the best thing to do is to break it down into byte sized pieces. Before jumping headfirst into a design plan it’s important to look for inspiration. Go through decorating magazines, Pinterest and look at the world around you. Keep an open mind and collect any items of inspiration that you can. Determining the purpose of the room is half the battle won. A room that is used primarily for relaxing and watching TV will be very different from one that’s meant for formal entertaining. Think about everyone in your household and determine how they’re most likely to use the room. This will make it much easier when its time to work out a floor plan and buy furniture. Go through your house and do an inventory of what you already have. 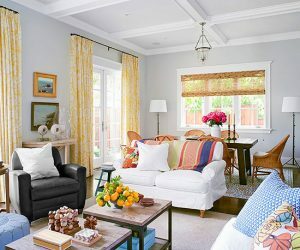 Sometimes moving something from one room to another can give it new life, as can a new coat of paint or upholstery job. This is one step you cannot afford to miss out on. Pull out some graph paper and make a sketch of how you’d like to arrange the furniture. Or use online software to work this out. It doesn’t have to be perfect but it will certainly help you figure out the space and what will fit. Never underestimate the power of a focal point. Sometimes they appear naturally as windows with a view or architectural detail, while other times you create them yourself, as with sofa sets, media units and televisions. Whatever your focal point is, make a decision and stick with it. You’ll want to arrange furniture around it as much as possible. 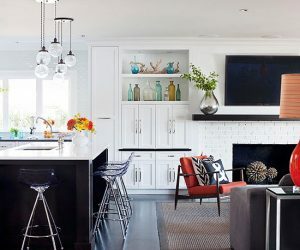 The size of the room will dictate how far you can place your furniture away from the walls, and even in a small space give pieces a little breathing room by allowing a few inches between the backs of furniture pieces and the walls. Despite popular belief, this little bit of space can actually make rooms feel bigger. Place the sofas and chairs facing each other (not necessarily straight on, but close), and they should be close enough that you can have a natural conversation with the person seated across from you without having to raise your voice. If the room is too large, create multiple conversation areas. Every seat should have easy access to either a side table or coffee table. When it comes to table height, side tables should be approximately the same height as the chair arms they’re next to (if that’s not possible, lower is better). 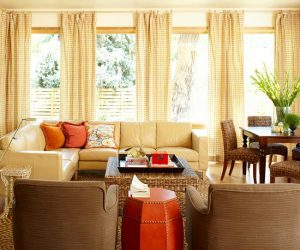 One of the most important things to consider when arranging furniture in any room is traffic flow. People should not be tripping over furniture, or each other, to pass through the room. Make sure there are a couple of feet (give or take a few inches) between the coffee table and sofa, and between chairs. Create a clear path so people can walk from one end of the room to the other without difficulty. Lighting is one of the most important elements of any room and can make a world of difference to how the room looks. 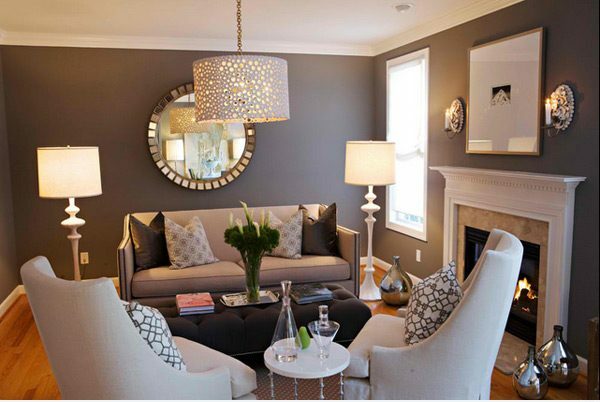 Always use a mix of overhead lighting, floor lamps and table lamps (and sconces if you can). A floor lamp looks great at the end of a sofa or behind an accent chair. Table lamps look lovely on side tables, shelves, and even mantels. Lighting needs to be placed at different levels in order to be properly balanced so use it liberally throughout your room. Think in layers – overhead (or ambient), task and accent – to create the perfect ambiance. 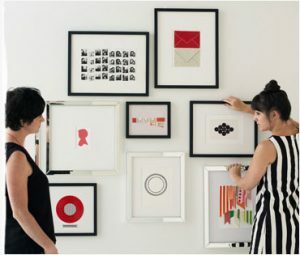 Objects that are wall mounted, whether its art, mirrors, or sculptural objects, need to be placed in relation to the furniture. 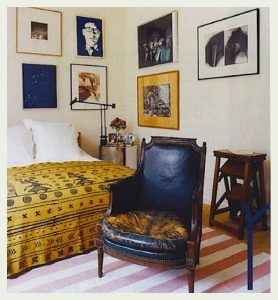 Don’t hang a tiny photo over the back of your sofa. Use either a large piece that is approximately two thirds the length of the sofa, or use a grouping of pieces. If you’re absolutely determined to use a particular piece of art and it’s too small, put it in a larger frame with a large matte around it. (For every problem there is a solution!). Some of us are born visualizing décor and furniture layouts, and some of us have to really work at it. But the single most important thing you can do to make your home look fabulous doesn’t cost you a rupee, but it may cost you your sanity ☹It’s understanding scale. Not that other kind of scale that ruins many a sanity – the bathroom scale – but the one otherwise known as “proportion.” Rooms are beautiful often because of the feelings that they evoke, and they give off good vibes usually because the proportions are correct. Decorator’s Hint: If comprehending the scale and proportion of a room and its furnishings tend to keep you dazed and confused, forcing you to rearrange your furniture and decor for hours on end, don’t hesitate to call in a professional decorator as in Studio Marigold Hiring a pro can help save your sanity – and save your money – in the long run.